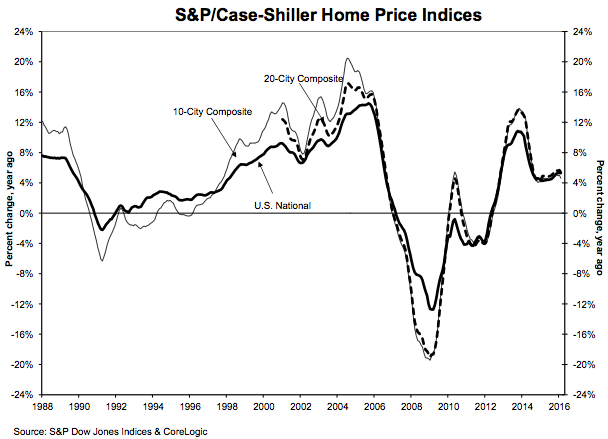 According to the S&P/Case-Shiller U.S. National Home Price Index released Tuesday morning, price appreciation of existing single-family homes continued in February, but at a slower rate than seen in recent months. The national index, covering all nine census divisions, was relatively unchanged in February, posting a 5.3% annual gain, while the 20-City Composite and 10-City Composite posted slower home price growth than seen in January, increasing 5.4% and 4.6%, respectively, compared to January’s 5.7% and 5.0%. Seasonally adjusted, all three portions of the index posted insignificant gains from January levels, and 10 of 20 cities reported increases (compared to 14 of the 20 before seasonal adjustment). The index is based on single-family dwellings with two or more sales transactions, and excludes new construction. However, February’s growth in the total value of existing single-family housing stock continues the growth seen over the past 12 months, and is a promising sign for home builders in the coming months, as rising homes values encourage new construction. The ability to provide affordable product to first-time and low-income buyers at a good margin remains to be a challenge for builders, however.